Don't miss Genevieve Bell, Margaret Heffernan, Marilyn Tam, Joey Tamer, and many more remarkable women at WITI's 2005 National Conference, May 5 & 6 at the LAX Hiton. Click here for more information. Whether you are a new manager taking on your first management position, or a seasoned professional taking the next step up the management/executive hierarchy, there are four things you must find out right away when you are about to take on a new role. 1. What is the real definition of your job? WITI and IDC are conducting a survey to discover how women use and interact with technology. Last year, women made the majority of tech purchases, outspending men by $14 billion. Yet, the tech industry has yet to embrace or understand that the female market is one to be taken seriously. Why do they listen to men and not to women in meetings? When women talk, what do men hear? How do you deal with gender differences? How do you leverage your gender strengths and weaknesses? Join us for this webinar on April 28 at 9am Pacific Time (12pm Eastern) as we discuss how to overcome gender challenges! All you need is a phone line and internet access. We will provide you with log-in details after you've registered. Register today! For more info contact Maria Flannigan at [email protected]. The biggest asset any company has today is its people. Since all companies are in business to make a profit, it makes good business sense to invest in your people. The greatest lack in the workplace today is good interpersonal skills, leading to less productivity, in turn leading to lower profits. The Gartner Research group did a survey a number of years ago and found that "The greatest need for technology professionals today is interpersonal skills." That hasn't changed. In fact, all people need good interpersonal skills regardless of field, and those skills are needed in all areas of life. Deidre, as a WITI Member, submitted this article to WITI for publication. Do you have expertise to share? WITI gladly accepts submissions for publication! For more information or to make a submission, please visit the Members' Area. Are you plugged in to your local WITI Network? Be sure to join one of WITI's regional mailing lists to receive event announcements, partner information, and special discounts. Update your mailing list registration today! 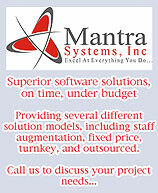 Mantra Systems is an elite Massachusetts-based technology consulting firm. We are revolutionizing the consulting industry by making it simpler and innovative. We strongly believe that we are engaged to help our clients in their initiatives, and client success is our ultimate priority. Mantra Systems is committed to servicing companies who value and welcome a diverse workforce. Mantra Systems is certified nationally by the Women's Business Enterprise Council, WBENC. Mantra Systems is an EOE. Lehman Brothers, an innovator in global finance, serves the financial needs of corporations, governments and municipalities, institutional clients, and high-net-worth individuals worldwide. Founded in 1850, Lehman Brothers maintains leadership positions in equity and fixed income sales, trading and research, investment banking, private equity, and private client services. The Firm is headquartered in New York, London, and Tokyo and operates in a network of offices around the world. Search for Lehman Brothers jobs on WITI4Hire. Lehman Brothers is looking for a project leader in the Information Technology division's Expense Management Technology team, which is part of the Finance Technology group. The Expense Management group within Lehman Brothers' Finance division is responsible for monitoring, managing and creating efficiencies within the Firm's non-personnel expense base. The position is responsible for managing the firm's PeopleSoft Financials system, which is live with Expenses in the middle of global rollout of Accounts Payable, Purchase Orders and Asset Management, by managing a group of offshore developers in India providing development and maintenance support. The ideal candidate will have experience supporting a Finance division/group (Expense Mgmt, Procurement, Accounting Services, Fixed Assets, etc.) and experience managing resources in another location. The candidate should also be an excellent communicator and comfortable operating in a large, financial services firm environment.